Remembrance of Fr. Jim Sloan, C.PP.S. 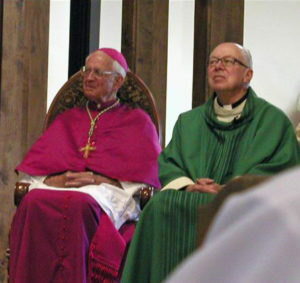 Bishop John Cummins and Fr. Jim Sloan, C.PP.S. at Mass in honor of Fr. Jim’s 50th anniversary of ordination. [Fr. James Sloan] gave us a great number of years of service. 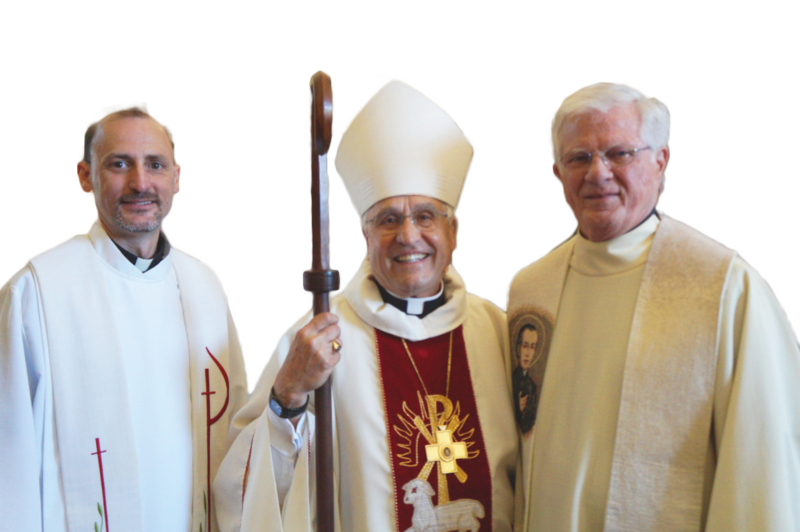 This included the position of parochial vicar and especially that of pastor and his years as emeritus at Sonnino House in Berkeley. He participated very much in the activities locally and was an astute member of our local clergy. I particularly would single out for commendation the talent he brought to the building committee of the diocese and especially the planning group for the building of Christ the Light Cathedral. He modestly referred to himself as possessing some training in liturgical art. But all appreciated that training in the matter of architecture. Furthermore he was a skilled participant in dialogue offering his comments and judgements respectfully and responsibly adding his observations to the conversation. He had great conviction about the sharing of insights. He also joined the large number of Missionaries of the Precious Blood who served here in the diocese and all the way back to the early days in the Archdiocese of San Francisco with the provincial house that was welcoming to all of us in Saratoga, the parish on the Peninsula, the one in Manteca, Santa Rosa and our own here. I go back to the memory of Father Clayton who brought cordiality and good will from his first arrival years ago. I remember with affection so many – John Hamme, Aloys Selhorst, the Franck brothers, Paul Link, Marv Steffes and so many others who secured themselves deeply in the presbyterate here. Jim was with those and so many others in an endearing way. I appreciated his continuous kindness to me and his sociability on every occasion, particularly in telling me his move to Nazareth House followed of course later by the return to Ohio.